Lake Gairdner is a huge endorheic lake in Outback South Australia. Endorheic lakes are bodies of water that do not flow into the sea. Most of the water falling on earth finds its way to the oceans through a network of rivers, lakes and wetlands. However, there is a class of water bodies that are located in closed or endorheic watersheds where the topography prevents their drainage to the oceans. When the Lake Gairdner is flooded it is considered the fourth largest salt lake in Australia after Lake Eyre, Lake Torrens and Lake Frome. The glistening white surface, surrounded by red hills and red beaches, is a beautiful sight. Along with Lake Everard and Lake Harris, the area is protected as Lake Gairdner National Park. 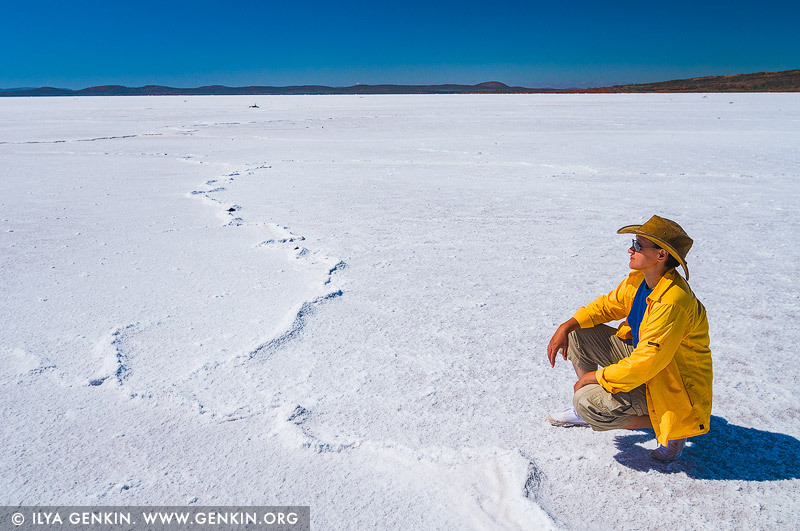 The lake is over 160 km (100 miles) long and 48 km (30 miles) across with salt over 1.2 metres (4 ft) thick in some places. It is located west of Lake Torrens, 150 km northwest of Port Augusta and 440 km northwest of Adelaide. It is located in the Gawler Ranges. This image belongs to the travel and nature stock photo library. This stock photo of Woman is Observing the Lake Gairdner is available for licensing for commercial and editorial uses including websites, blogs, books, magazines, brochures and advertising. Restrictions may apply for images which contain third party copyrighted material or sensitive subjects. Photos of artwork are for editorial use only. This image id AU-SA-LAKE-GAIRDNER-0011 of Woman is Observing the Lake Gairdner, is copyrighted © by Ilya Genkin. This is not a public domain image.